Yes, I know it is December. Like I said in my last post I have had a few posts in mind for a while. Perhaps this time of year we can reflect on last summer's activities. I used to hate it in school when the teacher would assign a writing assignment on the topic of 'What I did on my summer vacation'. We used to move every summer or two, my dad was in the Army. 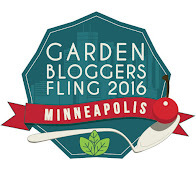 Last summer I attended the Garden Bloggers Fling in Portland....a great trip that warrants multiple posts, none of which is this one. 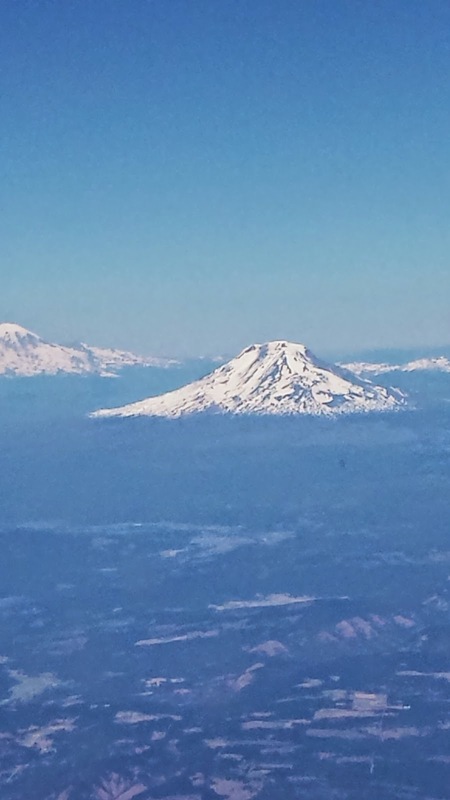 I did enjoy seeing the mountains out the airplane window. Mount St. Helens, Mt. Hood and ??? This post is a little closer to home. Do you explore your area as if you were a tourist? All too often we don't explore unless we have company. I am glad I was able to join a neighbor and her grandson on a short excursion up to Greenville. Our destination was Falls Park, in the center of downtown. Too often when going to Greenville I hadn't had time to walk around the Falls. The Reedy River runs right through the center of town. Various restaurants, apartments and shops have a front row view of the river. The river runs under Main Street and through Falls Park. Breath taking views are at every turn. Picturesque walking bridges cross the river, restaurants on the left and the Peace Center, performing arts venue, to the right. Additional water features dot the streetscape. A large cantilevered bridge takes you away from Main Street to the Park. Liberty Bridge, built 10 years ago, it a one of kind bridge. It is as if you are in the treetops. View back up to the bridge. A wonderful outing. I plan on going back and taking more time to explore the trails. We dodged some heavy downpours, luckily it didn't spoil our day and I came home with some good pictures. One item from Portland I wanted to share with you was one of my winnings from our banquet night. I won a Seed Sprouter from Botanical Interests. Last year I had hoped to win one when we were in San Francisco, but I didn't. This time I put many of my raffle tickets in for the drawing of the Seed Sprouter. I won! And I won again, and again....it was pretty funny. I passed on the second and third time my name came up. Once home I pulled out my seed packets and followed the directions for sprouts. After disinfecting, you rinse the seeds. Set up the Seed Sprouter, I had one kind of seeds on one tray and another type on the other tray. The seeds are sprouting! They need to be rinsed every day to keep them moist. In pretty short order we had sprouts. A wonderful addition to a salad or sandwich. The sprouts are a little peppery... and tasty! After our first round of sprouts I put the Seed Sprouter away for the summer. In our area we are light on mosquitoes but heavy on fungal gnats coming in on the seasonal fruit. Rather than fight the gnats I figured I would bring it out again this winter. So, short trips, long trips and prizes....a great summer. While I have a few posts in the 'hopper' I wanted to talk about yesterday. Yesterday was the perfect fall day to work in the garden. The sun was shining the air was cool, just lovely. My garden was suffering from total neglect since July, it looked like crap. Why you might ask. It gets stinkin' hot in South Carolina and the bugs are in full force, making being in the garden less than pleasurable. The last few weeks I have been becoming reaquainted with my garden. 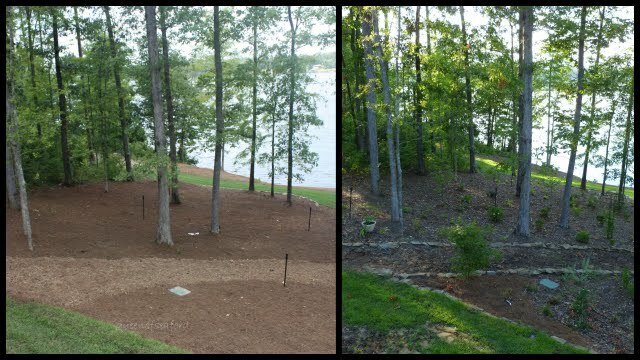 The shoreline was a mass of weeds, so I decided to work a couple hours each day, dragging out four or five large garbage bags of weeds and crabgrass out the the shoreline garden. I am almost finished. Maybe Monday? Who knows. Yesterday was a planting day. I had visited a local garden center and found a sweet little Itea virginica 'Little Henry' and was looking for a spot to plant it. There were multiple stems coming up around the circumference of the container. I know I can get a couple plants in this case. I had the main plant and three 'babies' to place in other spots. Don't you just love the bright red fall color? While figuring out where to plant some of the babies, I took a critical look at my native azalea, Admiral Semmes. Planted a few years ago it has failed to thrive. The first year it was gorgeous, it had big yellow blooms in the spring. I had visions of years down the road, this beauty would fill the space where it was planted. Well that didn't happen. Each year since it has declined, it has been maybe two years? Well, yesterday I dug it up, telling myself it needed to be in a better area and I could put a little baby Itea in its spot. The azalea was about the size of the main plant of the Itea in the above photo....pretty small for a shrub that has been in the ground for a couple of years. The root ball was equally small. The mass of roots was less than a softball in size and inside the small roots was a tangle of fairly large roots, circling the stem/trunk area. It had clearly been rooted in a small container, left too long and the roots were growing in a small circle. It was time for some root pruning. I first dunked the root mass into my watering can as I didn't have other water close by. See the hole at the top of the can? The roots fit in quite easily. Repeated dunkings and washing away soil and old potting mix and still the roots would not release. Have you pruned roots before? If you find a plant that has circling roots, you need to either uncurl those roots and pin them apart in the ground OR cut those roots apart. I tried to manually separate the roots over and over again. I was unsuccessful. I felt bad cutting so many roots...but kept telling myself that left alone the shrub was not going to do well. I cut straight down on two sides and repeated the dunking and pulling process. Once done I put the azalea into a new hole and spread out the remaining roots, covered with soil, and watered. I have done this before, another azalea that I bought earlier this year had severely girdling roots and needed some tough love. (see below) The one thing you must remember is to water frequently as the roots need soft moist soil to grow into. The azalea from earlier this year looks pretty good. The leaves held on and the stems are strong, no drooping. I look forward to this having a great presence in the garden. As for Admiral Semmes- see the photo below....sad. I will let you know how he does this spring -- there might not be blooms but if I get a lot of spring growth I will be happy. 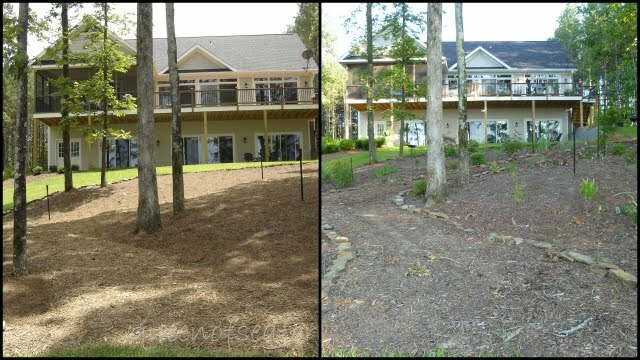 Root pruning, taking out girdling roots, is beneficial for the growth of shrubs and trees. Imagine if those closely circling roots never were cut, just growing larger and larger, squeezing tighter and tighter, not allowing water and nutrients to travel to the body of the plant. I am trying to make it a practice, when planting new woody shrubs and trees, to check the root structure-- all the way to the center of the root ball. A little prevention early in the life of the plant will allow strong growth. I know I have been MIA for a while on the blogging front---time flies! I noticed while checking the blog for info on one of my tree posts that it has been four months since posting. Facebook has allowed me to post just bloom pictures every day and many of my non-blogging friends seem to really enjoy it. 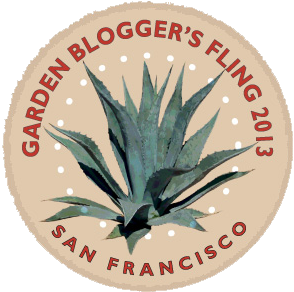 It is time to update the blog with this year's garden progress report. Without further ado- let's see how the gardens have changed over the past few years. We moved here in 2010 - so we are starting our fifth year living on Lake Greenwood and enjoying retirement. With phone in hand to take photos that match last year's post, I set out in the yard. 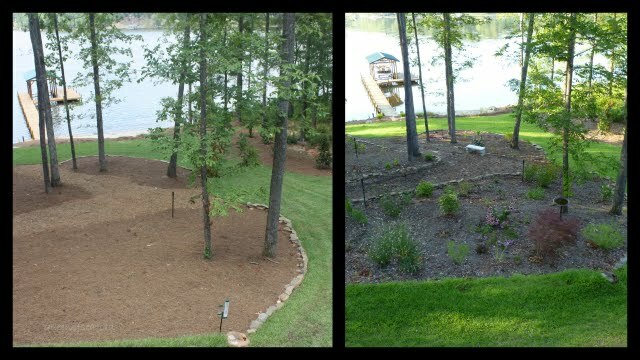 The photo below is a side by side of the left hand side of the backyard from 2010 and then one year later 2011. 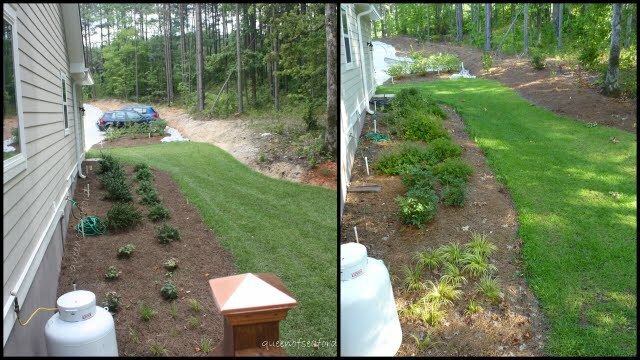 Besides plants being added, weeds, deer, voles and chipmunks help change the landscape. Many plants are lost to the elements...never to be seen again. Just a good reason to buy more, right? Here is the jungle of today. The trees have certainly filled in a good bit. 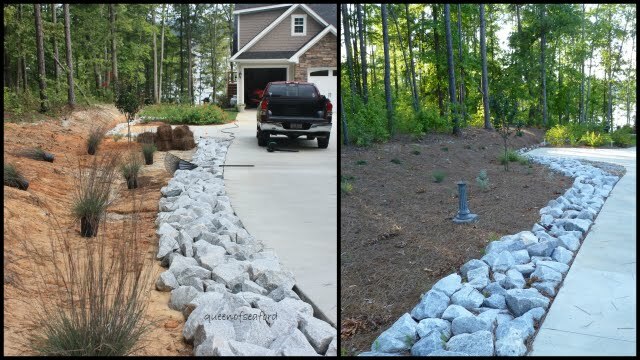 While it looks like a lot of plant material, at ground level there are a lot of open spots that may or may not be able to support something planted. 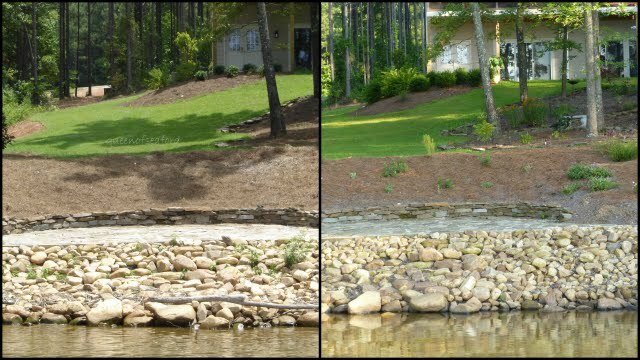 With the mature trees taking up most of the water, the shade area is really dry. I have two trellises in the garden, one has the Carolina Jasmine and the other has a Coral Honeysuckle growing on it. The right side of the backyard was originally sunnier than it is now. As the mature trees filled out each year, my window of sunshine has gotten smaller and smaller. The beautiful Japanese maple 'Garnet', almost invisible in the picture from today, has filled in nicely. Apparently last year I did a panoramic shot of the whole back garden. What I find interesting is the later blooms this year. It was a hard winter, many plants didn't bloom. Some plants died back to the ground and took a long time to show signs of life. Many of my hydrangeas didn't bloom this year as we had another cold snap after buds were starting to emerge. From the water the views early on were pretty stark. A step to the left corner, the view back up to the house across the yard shows the lower gardens. The amazing change this year is how slow the elephant ears are filling in. The garden bed with the elephant ears is filled with daylilies-- many of which had the buds eaten by Bambi and her momma. I have bamboo stakes posted through the garden and fishing line wound around like a spider web...to deter the deer. Some puppy dog went through the lines and broke many of them....now I have to restring them. The deer found the open spots-- and tasted many daylily buds. Walking down to the water and checking out the bank....another blank palette a few years ago. Add a few colorful chairs and more elephant ears, some grasses (ignore the weeds!!) and the bank is colorful and filling in nicely. This year, again, check out the difference with the elephant ears from last year to this year. The shrubs along the steps are really getting big! The front was raw when we first moved in...lots of construction destruction, compaction and lots of gravel. The Chinese Fringe tree, Chionanthus retusus is getting really tall. In 2013 it didn't bloom, it did this year, but at the upper reaches of the branches....hard to photograph. Last year the Lantana took a long time to bloom. This year the Lantana is blooming! Now if the Daylilies, Hemerocallis 'Sammy Russell' the Lantana AND the new Tiger lilies would all bloom at the same time..... I would have a nice show of color..all hot colors. The grasses along the driveway and the Crepe myrtle are doing surprisingly well, considering this is a seldom watered area. This year I added some Sun Coleus in a large container...adding some color along the drive. The front garden is still a work in progress-- some of the Gardenias are doing very well, and some, not so much. The Loropetalum 'Daruma' are very happy under the bay window. One perennial that I was very happy to find is Japanese Aster, Kalimeris pinnatifida, it is a nice pop of white sprinkled through the garden. To this year....what a beauty! Another shot of the Japanese Asters, Becky daisies, and Coral Bark maple. This garden is Deutzia gracilis 'Nikko' blooming white tiny flowers in the spring, a couple variegated Hydrangeas (which are not going to bloom as all the buds from last year froze) and this year I added the white and green Caladiums. It is an easy garden bed to tend to. The favored plant in February and March, Edgeworthia chrysantha was quite full last year. The winter took its toll on it this winter. As it is a zone 8 plant and we had single digit temperatures, I am lucky there was only a little dieback. Only one of the hydrangeas is blooming now- it is one of the Endless Summer series. The Callicarpa dichotoma 'Issai' is huge. I am thinking about taking them out as they are reseeding everywhere. 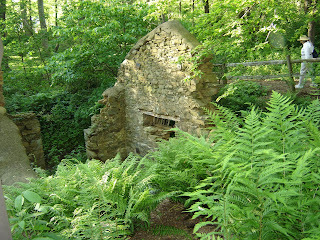 The lower side is slowly getting swallowed up with honeysuckle vine, blackberry brambles, and other wild things from the woods. This winter I am getting in there and cutting it back.... not now, too many bugs. So now we are back to the front -- my view from the front door. And this year's view....and no, the shutters aren't painted and put on the shed yet. I will be back on a regular basis....I promise. 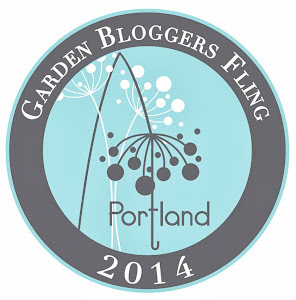 Can't wait for our Portland Fling. Hope to see you there!